Meanwhile the Zimbabwe National Liberation War Veterans Association has thrown its weight behind actions taken by the Zimbabwe Defence Forces to restore normalcy in the social, political and economic life in the country. This was said by the ZNLWVA Secretary General Cde Victor Matemadanda while addressing a press conference this afternoon. 13: 28 - He says unlike the Lancaster House Constitution, the 2013 Constitution was written by all political parties. 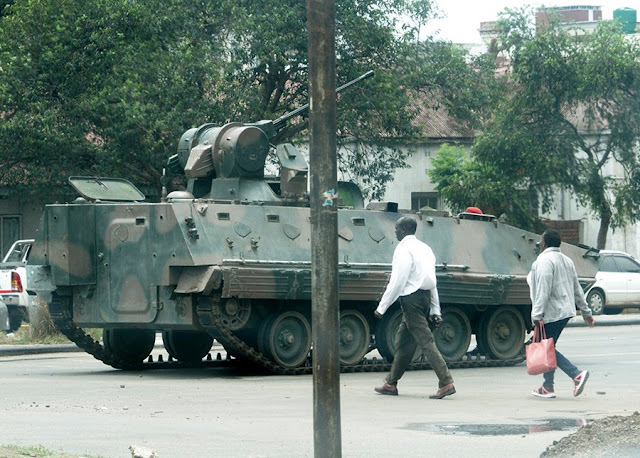 Zimbabwe National Liberation War Veterans Association applauds the role taken by the Zimbabwe Defence Forces to normalise the situation in Zanu-PF and the country. ZNLWA says Zanu-PF should return to constitutionalism and reverse all the expulsions and suspensions that were spearheaded by the G40 cabal . ZNLWA demands that President Mugabe explain why he chose to associate himself with Jonathan Moyo and failed to recognize the response by Cde Mnangagwa. ZNLWA says President Mugabe should be recalled as the first secretary and President of Zimbabwe. 2:25pm EU has called for a “peaceful resolution” to the #Zimbabwe crisis. “It is a matter of concern for the EU. We call on all the relevant players to move from confrontation to dialogue with the aim to a peaceful resolution. 1:55pm The United Kingdom’s foreign secretary, Boris Johnson, says he wants to see stability in Zimbabwe. 1:00pm Lunchtime news on ZBC TV sees regular presenter read out the news bulleting instead of major general Sibusiso Moyo. The main item on the bulletin is the army’s early morning broadcast soon after their “takeover” of ZBC. “President Jacob Zuma, in his capacity as Chair of Sadc, is sending Special Envoys to Zimbabwe and Angola in light of the unfolding situation in the Republic of Zimbabwe. "The President is sending the Minister of Defence and Military Veterans, Ms Nosiviwe Mapisa-Nqakula and the Minister of State Security, Adv Bongani Bongo to Zimbabwe to meet with President Robert Mugabe and the Zimbabwean Defence Force. "President Zuma spoke to President Robert Mugabe earlier today who indicated that he was confined to his home but said that he was fine. South Africa is also in contact with the Zimbabwean Defence Force (ZDF). "The Special Envoys will also be sent to the Republic of Angola to see President Joao Lourenco, Chairperson of the Sadc Organ on Politics, Defence and Security to brief him on the situation. "President Zuma has reiterated his call for calm and restraint and for the ZDF to ensure that peace and stability are not undermined in Zimbabwe. “He was chairman of the Joint Operations Command, which is a military structure here that's been in existence since independence. “Nothing like this could have happened without him. He's a brilliant operator and organiser. “I think very shortly we will hear that Mr Mugabe has retired from political life and he's appointed Emmerson Mnangagwa as his successor." Chinese Foreign Ministry spokesman Geng Shuang said the Defence Ministry had already released information about his trip and that he didn’t have an understanding about the specifics of his reception in China. "President Jacob Zuma, on behalf of the Southern African Development Community (Sadc), has called for calm and restraint and has expressed hope that developments in Zimbabwe would not lead to unconstitutional changes of government as that would be contrary to both Sadc and African Union positions. The president has urged the government of Zimbabwe and the Zimbabwe Defence Force (ZDF) to resolve the political impasse amicably and has urged the ZDF to ensure that the maintenance of peace and security in the country is not compromised. Sadc will continue to closely monitor the situation and remains ready to assist where necessary to resolve the political impasse in keeping with established Sadc protocols and processes." "Due to the uncertain situation in Harare, incl. reports of unusual military activity, we advise British nationals in the city to stay safely at home/indoors until the situation becomes clearer. Monitor this account for updates."